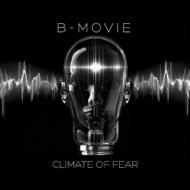 - UK new wave icons, B-Movie, best known for their 1982 international smash hit single Nowhere Girl, continue their triumphant return with this brand new album featuring all 4 original founding members! - The band's third album since their well-received reunion in 2012, Climate Of Fear finds Steve Hovington and company at the peak of their moody melodic rock powers, sounding as fresh and vibrant as they did in their heyday, with a whole new set of keyboard-driven classics such as the superbly danceable lead off single Another False Dawn, the wonderfully moody title track Climate Of Fear and many more! - Bonus tracks include a recently recorded version of Nowhere Girl along with remixes by German industrial legends Die Krupps and Le'ther Strip as well as Los Angeles-based indie electro band Deathday! - Available on both CD and a special limited edition vinyl set that includes all 4 remixes on a separate 12!